OLA cabs has become one of the popular cab service in Chennai. Nowadays lot of people prefer to use OLA cabs because of their amazing offers. With OLA cabs, call taxi rides have become cheaper in Chennai. Nowadays even I am using OLA cabs frequently. Sometimes we face problems with the booking. But still many people prefer it as OLA provides very cheaper cab rides. 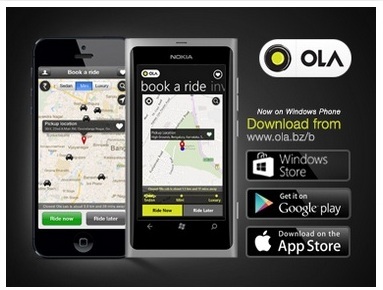 In this long weekend, OLA offers 25% off for its customers. How to avail this OLA 25% off ? 1. Open the OLA App. If you are a new user to OLA cab, register using the referral code - ODPF3H to get free coupons worth Rs.100. 2. Give required details to book the cab and select the cab ride. 3. Hit 'RIDE NOW' button. 4. Apply the OLA 25% discount offer code 'OM25' to get 25% off. To get this offer, you should pay with OLA Money(powered by ZipCash). 1. You should have a minimum ola money balance of Rs.100. If not, recharge. 2. Maximum discount is Rs.75. 3. The maximum discount that will be provided is Rs.100. 4. The offer is valid only on mini, sedan rides in Chennai. 5. If you have not received the cab driver details, call the OLA chennai customer care number and check with them. What are you waiting for? Recharge now, ride with ola in Chennai and get 25% off offer.